Cards2Kids was founded by John Makowiec, a Chicago-area teenager who’s passion for collecting sports cards began when he was just five years old. 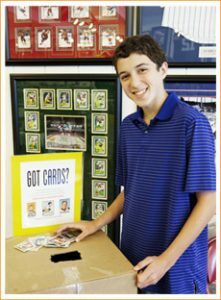 Over ten years later, as a high-school sophomore, John created Cards2Kids – a charitable organization that collects new and used sports cards and donates them to kids in need through national and regional charities such as the Boys & Girls Clubs of Chicago and Children’s Memorial Hospital. As an avid collector, John wanted other kids – especially those who are ill or may not have the means to collect sports cards – to experience the joy of collecting sports cards and holding your favorite player in the palm of your hand. And after partnering with organizations such as the Chicago Cubs and Upper Deck to set up collection drives and working with local card shops to collect donations, Cards2Kids has collected over 500,000 sports cards and counting.